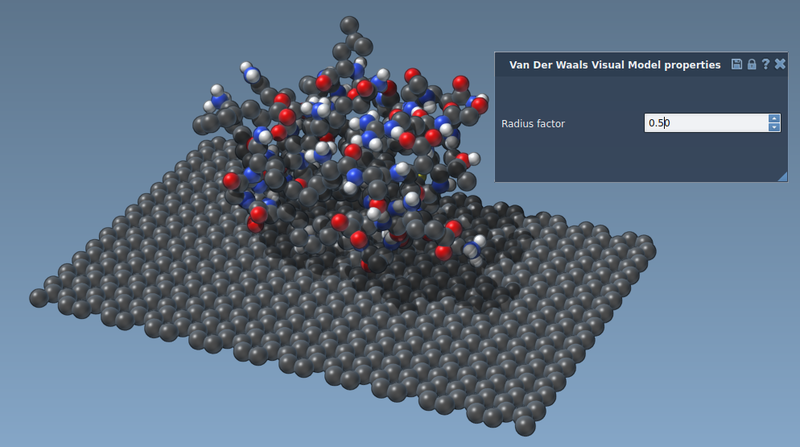 This tutorial shows you how to create a new visual model that shows the van der Waals representation of a group of atoms. 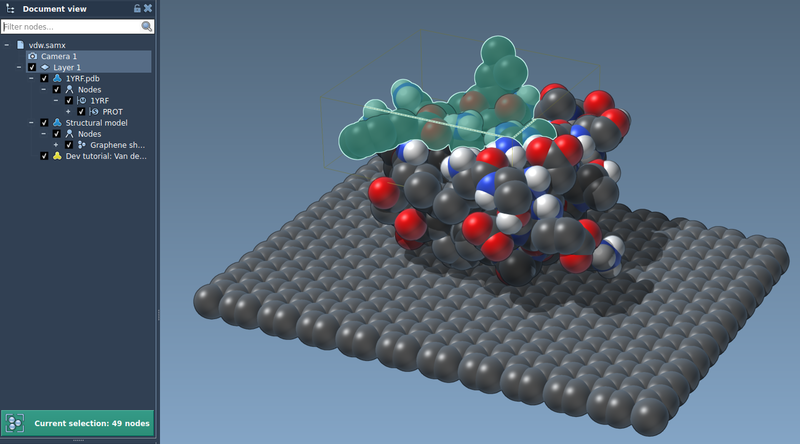 Note: SAMSON already has a Van der Waals visual model which is installed by default. 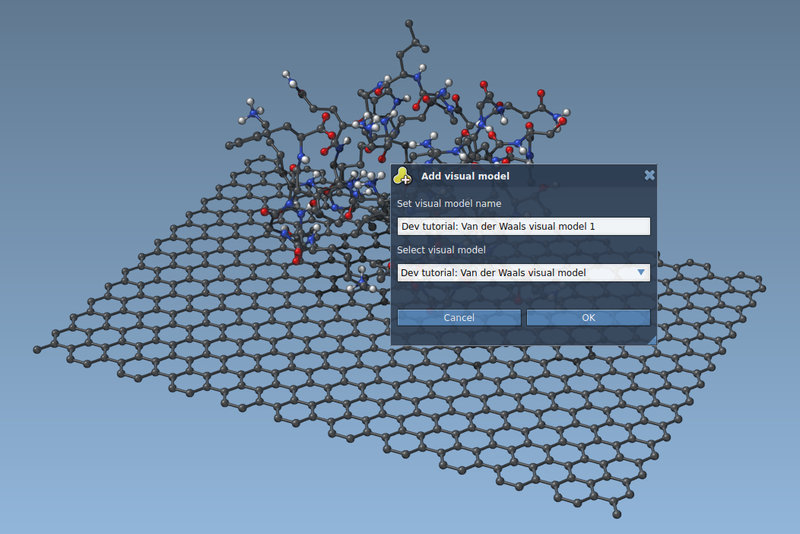 The SAMSON Element generator generates a visual model class (derived from the SBMVisualModel class) and a property widget class for the visual model. Now, try building the SAMSON Element. A visual model is applied to a group of nodes passed to the constructor of the visual model. Since we want to apply a van der Waals visual model to a group of atoms, we add a member to the visual model to remember the list of atoms that we were passed. A pointer indexer is similar to a node indexer, thus assigns indices to pointed objects, but automatically removes references from the indexer when a pointed object is deleted (in the C++ sense) so that it can never point to deleted memory. First, we collect atoms among the nodes passed to the constructor of the visual model (possibly among their descendants), then we add the atoms to the atom indexer atomIndexer. The property window of a visual model is mainly used to display the possible parameters of the visual model to the user such that they can be modified. Note: This is also can be done via the introspection mechanism by exposing visual model attributes. In this case they could be modified via the Inspector. To display something in the viewport, we overload the display function of the visual model. For convenience, SAMSON provides many functions to ease rendering objects (instead of having to use OpenGL functions). In this tutorial, we are going to use the displaySpheres function, to draw one sphere per atom, with a radius equal to the van der Waals radius of the atom. Let's now code inside the display function of the visual model. Observe the different array sizes above: we need 3 float per atom for the position, 1 float for the radius, 4 float for the color (red, green, blue, and opacity), and 1 unsigned int for flags used to alter the rendering colors (e.g. the selection flag and the highlighting flag). Here, first we check whether the atom has been deleted or not. Thus, we will display spheres only for atoms, present in the data graph. Then, we fill the position array and the radius array based on atom's position and the van der Waals radius, respectively. Both physical quantities have length units (SBQuantity::length), so we extract their numerical value with the getValue function, and cast the resulting double as a float, which is expected by the renderer. Then, we fill the color array based on the material applied to the visual model, if any. 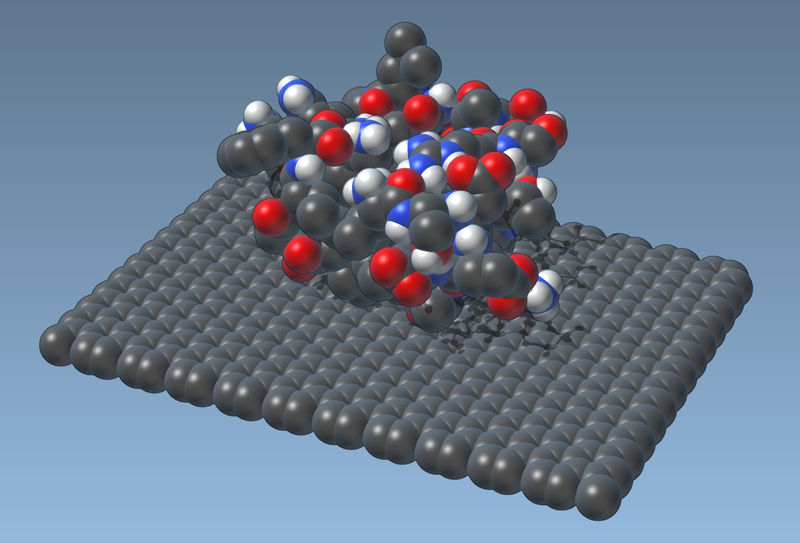 Precisely, if a material is applied to the visual model, we charge it of filling the color array, based on the current atom we’re examining. Else, we check whether the atom itself has a color scheme in order to use it. Else, we set the color to white (red, green, blue and opacity are set to their maximum value: 1.0f). Finally, we fill the flag array based on an “or” combination of the flags of the visual model and the flags of the current atom, to help the user have visual feedback when nodes are highlighted or selected. Here we get the CPK color for a current atom element type. 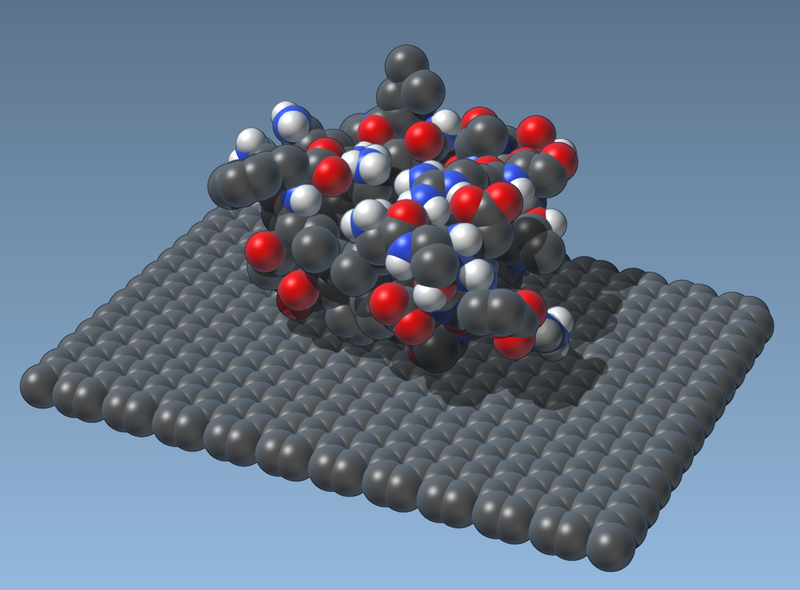 You can see that the visual model does not cast any shadows, and the only the shadows you see are casted by the molecule itself. Learn how to make you visual model to cast shadows in the next section. Let's now make it possible for the user to change the size of the spheres. via the property window of the visual model. You can use either one of them or both. Here, we specify the type of the attribute (const float&), the class, the root name of the getter and setter functions, the description of the attribute, and an attribute's group (a group box in the Inspector window where this attribute will be placed). Here, we set the radius factor of the visual model from the property window and request to force the update of SAMSON's viewport which will render the viewport thus rendering the visual model with new parameters. save documents in SAMSON format files (.sam, .samx) and further load it from them. Please, see the Serialization section for more information. By default, the newly created visual model is not serialized. Open the SEVanDerWaalsVisualModel.cpp file and modify the isSerializable function to return true. This indicates to SAMSON that this class is serializable. Now, we need to re-implement both serialize and unserialize functions. First, all nodes that are to be serialized are added to a nodeIndexer. This way, each node that's about to be serialized has an index. It's those indices that need to be used to indicate which nodes are referenced by other nodes if the referenced nodes are serialized as well, else we need to use addresses of the referenced nodes. Then, the serialize function of each node is called. This function receives the nodeIndexer. First, it creates all required nodes and indexes them in a nodeIndexer, in the same order as during serialization. Then, the unserialize function of each node is called. This function receives the nodeIndexer. The serialize function allows for serialization of your visual model. First we invoke the serialization function of the parent class. The parent functions do many things (all the way up to SBNode itself, i.e. SBVisualModel::serialize calls SBModel::serialize which calls SBNode::serialize) and are needed for correct saving and loading of node properties. This allows to save the node's name, visibility flag, a material, etc. Then we save information on our visual model itself: the radius factor, number of nodes to which the visual model is applied (nodes referenced by the visual model), and the indices of these nodes in the nodeIndexer or their addresses. For the last part, we check whether the atom itself was serialized or not. Basically, saving of the document leads to the serialization of every node that can be serialized, while copying leads to the serialization only of the copied nodes. If the atom was serialized we save its index in the nodeIndexer, else we save the atom's address. The unserialize function allows for unserialization of your visual model. First, we invoke the unserialization function of the parent class. This will create the node in the data graph. Then we read information on our visual model itself: the radius factor, number of nodes to which the visual model is applied (nodes referenced by the visual model), and the indices of these nodes in the nodeIndexer or their addresses. We check whether the atom itself was serialized or not. If the atom was serialized we read its index in the nodeIndexer, else we read the atom's address. This code allows us to both copy the visual model in the data graph and save it in SAMSON format files or load it from them.